What kind of a blighted society turns the word “snowflake” into an insult?, I sometimes catch myself thinking, but then again, I’ve never understood why “treehugger” should offend. All irony aside, being known as a person who loves nature or resembles one of its most elegant creations should be a mark of distinction, no? At least that’s what Wilson "Snowflake" Bentley surely thought. 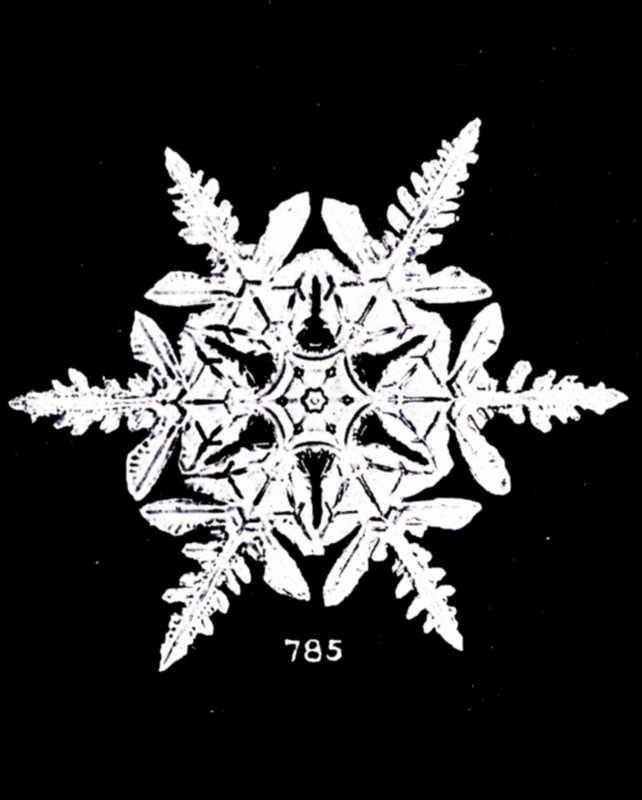 I found that snowflakes were miracles of beauty; and it seemed a shame that this beauty should not be seen and appreciated by others. Every crystal was a masterpiece of design and no one design was ever repeated. 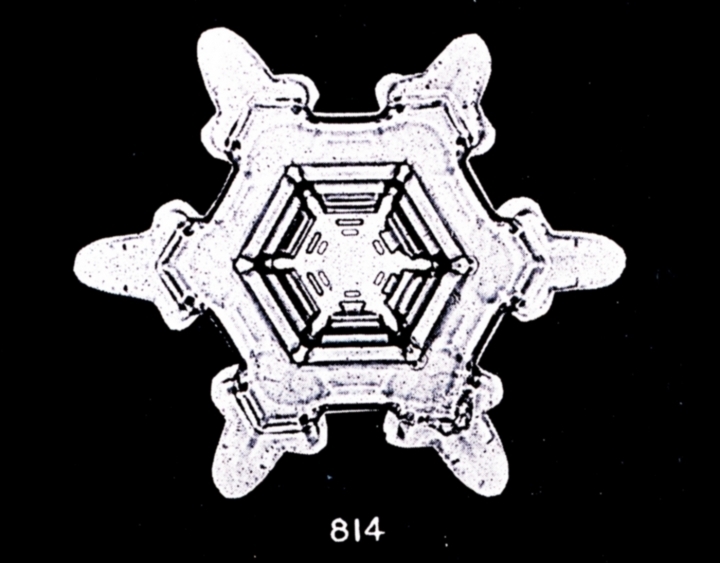 When a snowflake melted, that design was forever lost. Just that much beauty was gone, without leaving any record behind. Bentley left a considerable record—though still an insignificant sample size given the scope of the object of study. 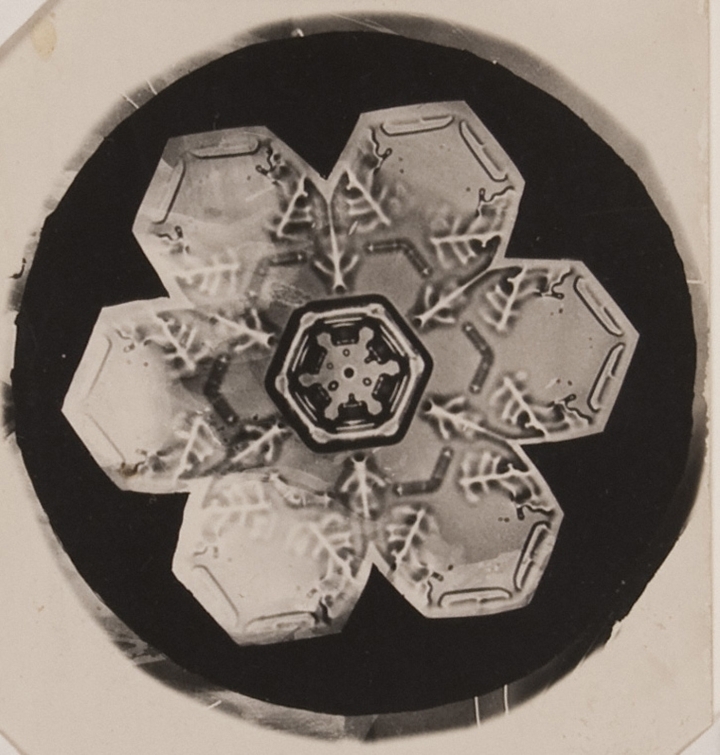 But his photographs give the impression of an infinite variety of different types, each with the same basic crystalline latticework structure. 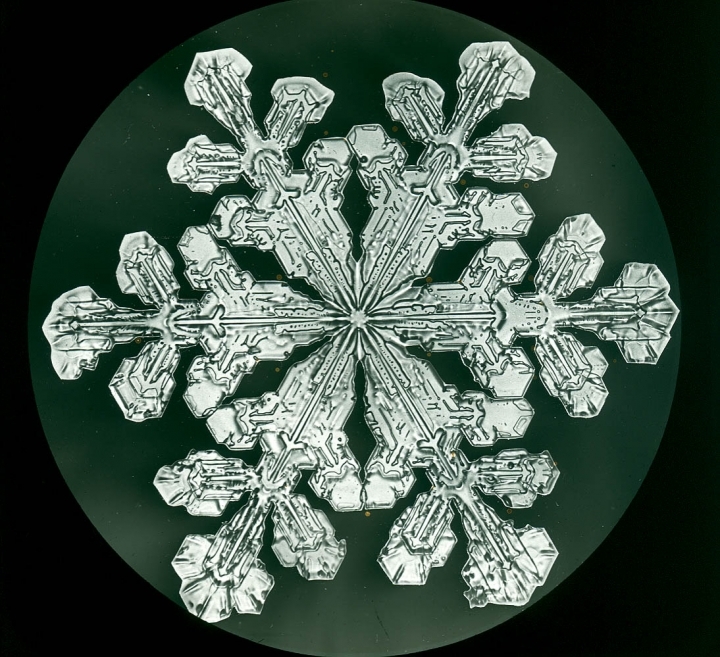 He took his first photograph of a snowflake, the first ever taken, in 1885, by adapting a microscope to a bellows camera, after years of making sketches and much trial and error. Some great portion of this work must have been tedious and frustrating—Bentley had to hold his breath for each exposure lest he destroy the photographic subject. But it was worth the effort. 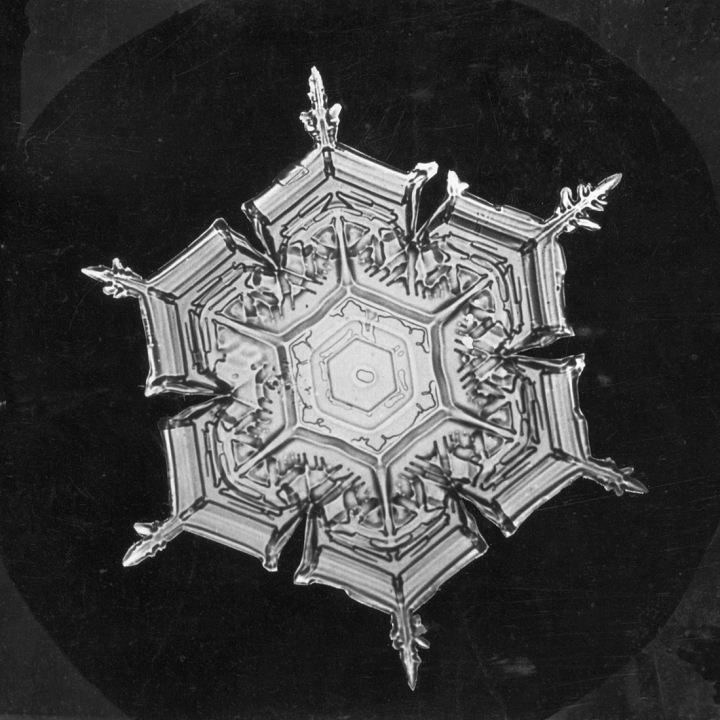 Bentley, the Smithsonian informs us, “was a pioneer in ‘photomicrography,’ the photographing of very small objects.” Five hundred of his photographs now reside at the Smithsonian Institution Archives, “offered by Bentley in 1903 to protect against ‘all possibility of loss and destruction, through fire or accident.” You can see a huge digital gallery of those hundreds of photos here. Along with U.S. 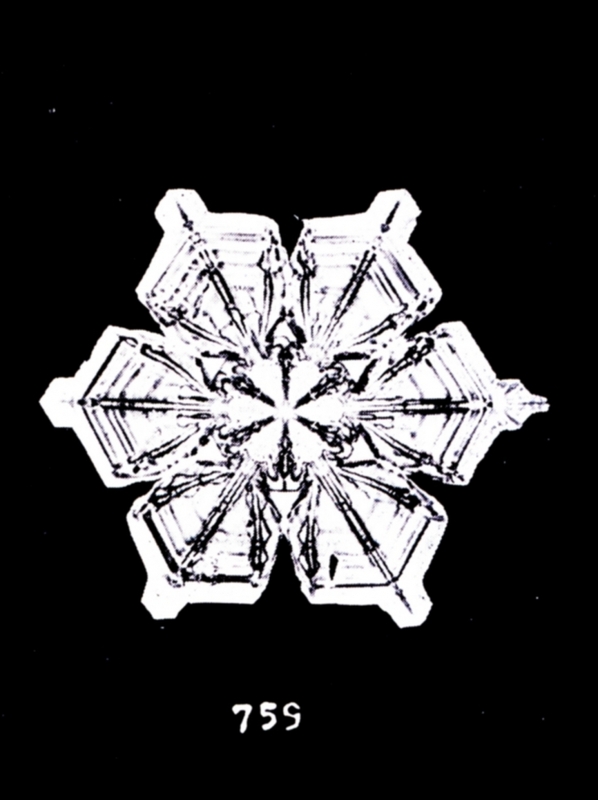 Weather Bureau physicist William J. Humphreys, he published 2300 of his snowflake photographs in a monograph titled Snow Crystals. Bentley also published over 60 articles on the subject (read two of them here). Despite his contributions, he receives no mention in most histories of photomicrography. This may be due to his provincial location (he never left Jericho, VT) or his lack of scientific training and credentials, or a lack of interest in photos of snowflakes on the part of most photomicrography historians. Real snowflakes have many imperfections, and perhaps Bentley did snow a disservice to so strenuously suggest otherwise. But the record he left us, Meier notes, “is appreciated as much as an artistic archive as a meteorological one.” He might have been a scientist when it came to technique, but Bentley was a romantic when it came to snow. His story is as fascinating as his photographs. Maybe a delightful alternative to the usual Christmas fare. There's even a children's book called... what else?... Snowflake Bentley.